can help you decide which skid steer plow is right for your needs. If you have questions about Fisher® skid steer plows, please give us a call. Sarris Truck Equipment is a Fisher® repair service and dealership. 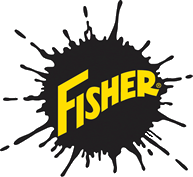 Fisher® is a National leader in snow and ice control products. 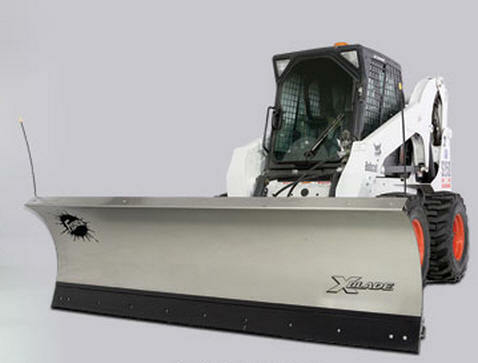 We offer a full line of Fisher® snow removal products including plows and spreaders. 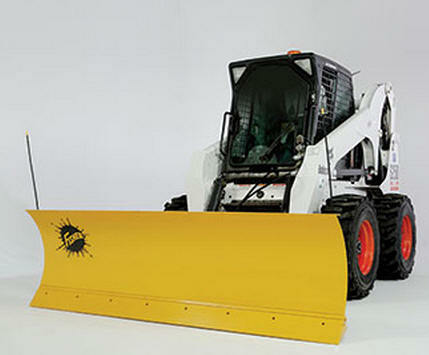 Whether you're a homeowner, small business owner, professional snow plower - town or city - Fisher® has a skid steer plow to fit your needs and Sarris Truck Equipment has the expertise to help you choose the right skid steer plow. Click on the Fisher® logo to the left to see Fisher's entire line of skid steer plows and snow removal equipment. The new HDX™ and HD2™ snow plows, as well as the popular XBLADE™ and HD SERIES plows are available with a universal skid-steer loader mounting plate for fast, easy hook-up. The heavy duty A-frame design features a reinforced steel box for extra strength to stand up to the unique stresses of skid-steer applications. All skid-steer models feature Fisher Engineering’s proven trip-edge design. Your equipment has to live up to the challenge your customers demand. That’s why pros like you choose the XBLADE™. With exclusive X-Bracing and a premium stainless steel moldboard, you simply can’t find a commercial snow plow built tougher than this. Available in corrosion-resistant stainless steel, the FISHER® XBLADE™ is built for tough commercial or municipal applications. In both 8’ and 9’ widths, the XBLADE features exclusive x-bracing ribs across the entire back of the blade providing superior structural rigidity. Mounted on your skid-steer loader, the XBLADE provides all the features you need for reliable, high-performance plowing. The blade is a full 31” high for plowing through the deepest snows. Available in 8’ and 9’ blade sizes, the XBLADE moldboard is built of premium corrosion-resistant stainless steel, for a plow that’s as rugged as it is striking, for the ultimate in durability and performance that hardworking professionals demand. Exclusive X-BRACING features two vertical and eight diagonal ribs – unsurpassed in the industry – for providing superior torsional strength and rigidity to eliminate moldboard stress. The extreme double angle base angle design provides superior strength and rigidity to eliminate stress on the blade. 1” base angle pins provide added strength for a longer life, and the high carbon steel wear pads provide the longest cutting edge wear of any on the market. 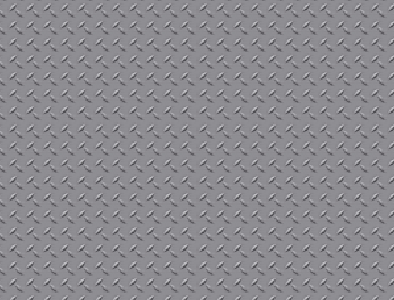 Only the edge of the blade trips when an obstacle is encountered. It’s much less jarring than a full-trip blade, and because the blade stays upright, plowed snow remains in front of the blade. The FISHER® trip edge uses compression-type springs. They never need adjusting and don’t stretch like extension springs. The industry’s best protection against wear and rust. The automated climate-controlled powder booth ensures uniform coverage to all surfaces. An epoxy primer enhances powder coat adhesion and improves corrosion resistance. Plus, the mark FISHER® yellow finish was reformulated to maintain that new snow plow look even longer. Designed for ½-, ¾- and 1-ton four-wheel drive trucks, as well as today’s 15,000 GVW Super Duty vehicles, these snow plow blades are 29” high and built with the heavy 11-gauge steel (12-gauge steel for the 7 ½' blade). Available in 7 ½’, 8’, 8 ½’ and 9’ widths. The full base angle does not require a cutting edge, allowing for more wear. Eight vertical ribs provide superior moldboard reinforcement. We build all our hydraulics ourselves, for outstanding speed and durability. Fast hydraulics allow you to change the blade position quickly and easily for efficient plowing. All critical hydraulic components are fully enclosed for protection from the elements. With the chain lift you can stack higher because you’re not limited by the hydraulic ram stroke, unlike cylinder lift systems, which can only pull the snow plow up as far as the limits of the cylinder’s range. In the rare event of a hydraulic failure, you can push the snow plow up into a snow bank and “short chain” the snow plow by attaching it to the specially designed bracket and safely transport the snow plow back to the shop. Match your vehicle to the correct Fisher accessory component with e-Match snow plow equipment selection guide. eMatch is a selection guide that easily identifies correct FISHER® snow plow options for a vehicle, based on a vehicle's unique specification. Proudly serving the towns of Waltham, Watertown, Belmont, Cambridge, Needham, Allston, Newton, and other cities and towns of the greater Boston, Middlesex County region of Massachusetts.